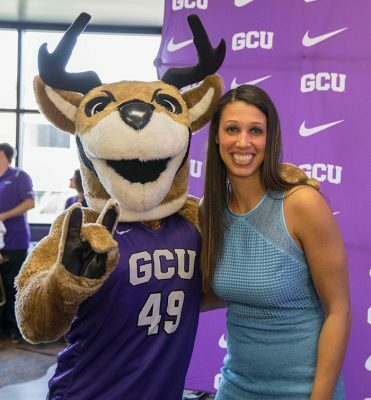 It’s Tuesday morning in a third-floor conference room overlooking the Grand Canyon University campus, and Nicole Powell’s first day as women’s basketball coach couldn’t be going better. 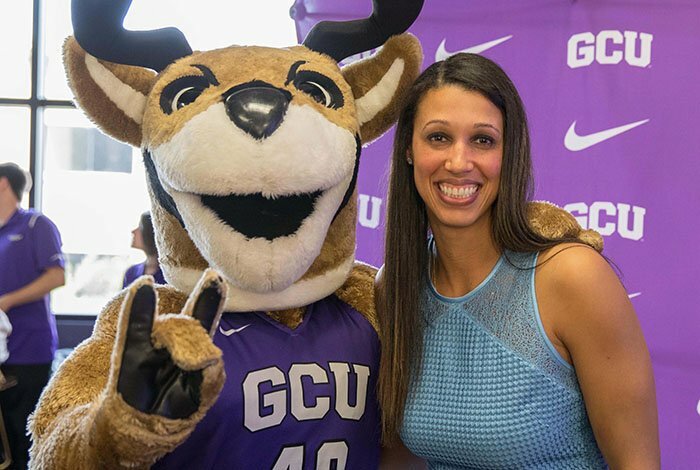 GCU’s new women’s basketball coach, Nicole Powell, gets a Lopes Up welcome from Thunder. And then her big day got even better than that. In a noontime press conference packed with University administrators, faculty, staff, student-athletes, cheerleaders and dancers, the Thundering Heard Pep Band and lots of other interested observers, Powell had to stand away from the microphone and try to contain her emotions as the nearly 30 seconds of applause, like her smile, seemed as if it would never end. “I’m overwhelmed, but in a really positive way,” she said afterward. “It’s one thing to have heard about it, to see it on TV and online, but I really felt the electricity here in the room and the love that the students and the staff have for this university. There’s just a tremendous amount of love and pride here, and I am so honored to now be a part of that. 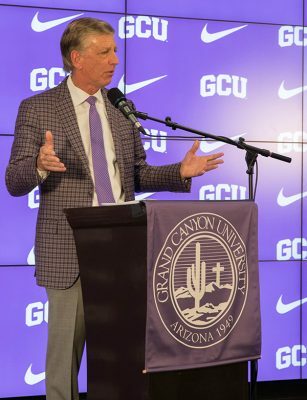 And there’s something else he noted: Like men’s basketball coach Dan Majerle, she was an accomplished college and professional player before deciding to go into coaching, and she brings to GCU a passion for the Valley. One difference: The 6-foot-2 Powell is a Phoenix native. She was named Arizona Player of the Century by The Arizona Republic after scoring 2,478 points at Mountain Pointe High School, then became a three-time All-American at Stanford and, during an award-filled 11-year pro career, a WNBA champion with the Sacramento Monarchs. What does it mean to be going home? … and welcomes Powell to her new position. But she didn’t consider coaching part of who she is until the latter stages of her playing days. As her role changed, she discovered her passion for mentoring young players. 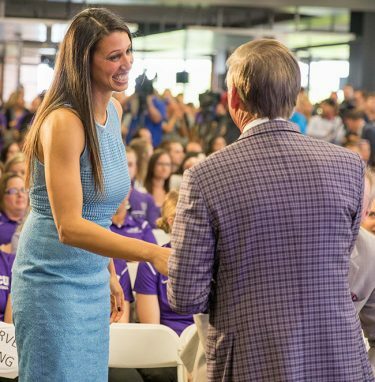 Mike Vaught, GCU’s vice president of Athletics, said that passion was a major factor in her selection, as was her energy and positive attitude. He knew of her, and when friends recommended her it reinforced what he had heard. So is her track record as a recruiter, honed the last three years at Oregon, which made the Elite Eight of the 2017 NCAA Tournament. With Powell’s help, Oregon’s recruiting class was ranked No. 3 in the country last year. The endless hours of travel, games and sitting in the living rooms of high school athletes might seem like drudgery to some, but Powell finds it fascinating. Powell, Jessica Gajewski (center) and Vice President of Athletics Mike Vaught listen to the speeches. “I like it. It’s fun,” she said. “It is challenging. It’s extremely competitive. When you’re going up against schools across the country with winning traditions and great coaches and great people, it’s not about putting others down, it’s about trying to shine and show what you have and that you will have the ability to get to these student-athletes and that you think about them. She looks forward to doing the same on campus, and she was pleasantly surprised to find out that the Havocs, GCU’s nationally recognized student cheer section, were part of the Tuesday festivities. That wasn’t because they were told to be there. They asked to be included, and one of the speakers at the press conference was the Havocs’ incoming president, Karsten Kem, who said they are eager to continue increasing their involvement in the women’s program. Powell talks to players on her new team after the press conference. 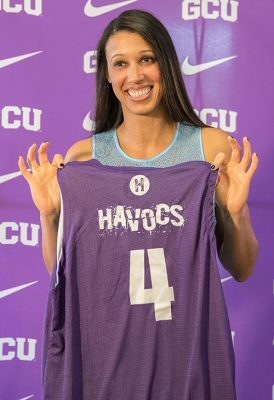 Powell shows off her very own Havocs jersey. Powell doesn’t remember ever visiting campus before her interview, but once she saw it she was ready to push forward, too. This wasn’t a tough decision for her. “Of course I’d heard of Grand Canyon before, being a Phoenix native, but I didn’t really know what was happening here,” she said. “After meeting with Mike, I was blown away by the vision that’s here and the work has been done over these past eight years under President Mueller and, of course, the athletic department. Seeing this transformation is incredible, not only the University but the students here and what they’re doing in the community. “My values line up with their values. That’s why I think it’s such a great fit and such a great match for me, to be part of this. After coming here and getting a chance to meet everyone else, other staff members and other coaches, and hearing who they are and why they bought in, I thought, ‘There’s no way I cannot be part of this!’ I’m so blessed, grateful, thankful that they felt the same. ● Coming to GCU also means that Powell is reunited with her former high school teammate, Sara Slattery. Here’s the story.